Founding faculty member at the Stanford d.School (Design Institute and Stanford). In this 70-minute session, Perry and fellow d.schooler Jeremy Utley illuminate the critical role that consumer insights play in driving disuptive innovations, the psychological biases that blind us to seeing such insights, and tools professionals can use to overcome these biases. Drawing from years of research and practice at Stanford University, Perry and Jeremy weave stories of corporate innovation together with hands-on activities to deliver a high-impact session that opens participants’ eyes to a new, more human way of working. Participants leave this session with a deeper understanding of, an appreciation for, and practical tools of design to drive their teams to better customer insights, and action. Low-Resolution prototypes and rapid experimentation have been popularized by the Lean Start-Up and Design Thinking methodologies for their ability to drive product development and consumer engagement at a fraction of typical product development costs; yet there are critical psychological biases that keep teams from using these tools. In this 70-minute session, Perry and Jeremy showcase several tools for rapid prototyping and user testing, and provide tangible experiences to convey the importance of the shift to rapid experimentation for the entire team. Participants leave this session with a deeper understanding of, an appreciation for, and practical tools of rapid prototyping and how they can use them actively in their current work withing an organization. In this 70-minute session, Perry and Jeremy illuminate the mindsets which distinguish Silicon Valley entrepreneurs. Drawing on years of running the startup accelerator, LaunchPad, they highlight new ways of working to create value in the marketplace, both as an individual founder, and as a team within an established organization. Participants leave this session with a deeper understanding of, an appreciation for, and practical tools to that they can use from a start up team in their work withing a larger organization. Perry and Jeremy will bring these lessons to life and draw that connection clearly back to their work. Many organizations have recognized the benefits of constructing diverse teams. Fewer have robust practices for leveraging the diversity of perspectives they have gathered, let alone processes for amplifying the benefits that a diverse team can contribute to the organization. Drawing upon academic research and real-world experience, Klebahn and Utley deliver engaging and dynamic speeches and workshops designed to help organizations amplify the innovation potential of the diverse teams they've assembled. Don't leave potential on the table. Turn your diverse team into a sustainable competitive advantage. Perry Klebahn is an innovator, an executive leader, and a co-founding member of the faculty at the d.School. 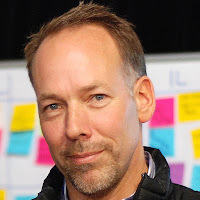 Perry has been making impact at Stanford since 1996 as a Consulting Professor, and as the Director of Executive Education programs for the d.School he now engineers the workshops that give business leaders on all levels a meaningful and hands on experience with the design thinking process. Perry focuses on teaching insights and innovation techniques that drive change in organizations to make real impact for companies. Perry is an innovator and entrepreneur at heart having founded Atlas Snowshoe Company in 1991. The pioneering design behind the first Atlas Snow Shoe was Perry’s graduate school project for the Stanford Product Design program that same year, and over the next ten years he designed, manufactured and marketed the first high performance snowshoe in the world. Perry later took leadership roles in larger companies such as COO for Patagonia and CEO for Timbuk2. Many organizations have recognized the benefits of constructing diverse teams. Fewer have robust practices for leveraging the diversity of perspectives they have gathered, let alone processes for amplifying the benefits that a diverse team can contribute to the organization. Drawing upon academic research and real-world experience, Klebahn and Utley deliver engaging and dynamic speeches and workshops designed to help organizations amplify the innovation potential of the diverse teams they've assembled. Don't leave potential on the table. Turn your diverse team into a sustainable competitive advantage.